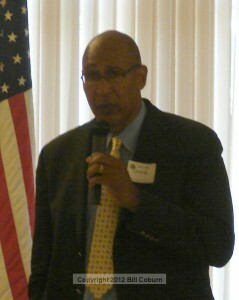 News Net file photo of Chris Holden at recent Kiwanis candidate forum. Press Release posted 12/3/12 – Assembly Member Chris Holden (D-Pasadena) was sworn in today as the representative of the new 41st Assembly District, and as the Majority Whip of the California Democratic Caucus. Holden’s inaugural legislative effort, introduced today, is a bill addressing economic development and jobs creation. AB 9 notes that California workers and businesses face the harshest economic conditions since the Great Depression. Unemployment in California remains in double digits. AB 9 provides the platform to develop, evaluate, and negotiate economic development policy. Mr. Holden has begun to meet with business and labor organizations, and with members of both political parties to explore areas of cooperation and consensus. Holden represents the 41st Assembly District, encompassing the cities of Pasadena, portions of South Pasadena, portions of East Pasadena, Sierra Madre, Monrovia, La Verne, Altadena, San Dimas, Claremont, and Upland. He previously served as a Councilmember and Mayor for the City of Pasadena, where he was first elected in 1989. Mr. Holden championed the creation of a living wage ordinance to improve the economic prospects of working class residents and chaired Pasadena’s Charter Reform Task Force for Schools. He also managed deregulation of the city’s public utility in a way that preserved local jobs while keeping rates lower than in the private marketplace. Mr. Holden has worked to expand the Metro Gold Line to connect the region to Los Angeles, which is now creating jobs and promoting business activity. He will work to ensure funding to expand the Gold Line to Montclair, connecting Los Angeles and San Gabriel Valley communities to the Inland Empire. Mr. Holden’s background as a small business owner and strong track record in economic and community development will assist him in evaluating policies for their ability to improve California’s business climate.